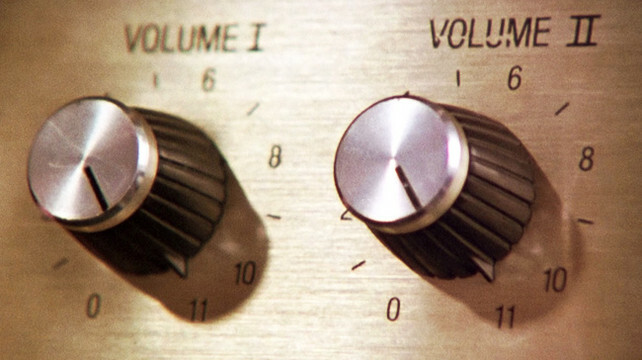 In the heavy metal mockumentary, This is Spinal Tap, the band’s himbo front man, Nigel Tufnel struggles with almost everything, including bringing his grating, 8 minute guitar solos to an end. Marty DiBergi: Does that mean it’s louder? Is it any louder? Marty DiBergi: Why don’t you just make ten louder and make ten be the top number and make that a little louder? Nigel Tufnel’s obsession with going one better reminds STT of the cult that keep telling us that our energy future lies with sunshine and breezes. Certainly not content with a piddling 20% renewable energy target, eager wind and sun worshippers are unlikely to be satisfied with a mere 50% RET. Indeed, the more zealous cult members exhort the irreligious to embrace a 100% RET – as if it were an edict delivered in stone to a faithful band perched on a mountain top. If Australia’s effective 23% Large-Scale RET can send power prices rocketing at 20%, year-on-year and place its electricity grid on the brink of collapse (South Australia with its own 50% RET has long passed the brink), just think what a 100% RET can do? As Nigel Tufnell ponders, where can you go from there? Well, if Australia needs that extra push over the cliff, why not put its suicidal obsession with wind and solar power up to 11? Jason Scott Johnston is an adjunct scholar at the Cato Institute’s Center for the Study of Science and the Henry L. and Grace Doherty Charitable Foundation Professor of Law at the University of Virginia School of Law. Here’s Jason explaining what happens when you put your renewables obsession up to 11. On May 31, the day before President Trump announced that the U.S. will withdraw from the Paris Agreement on climate change, the California Senate passed a bill mandating 100% of all electrical generation be from so-called “renewable” sources that emit no carbon dioxide by 2045. As the vote was strictly along party lines, this means that the General Assembly will also likely pass it and send it to Governor Brown for signature. California isn’t alone. The “100% renewables” movement has been sweeping across American colleges, and similarly “progressive” towns and some states, such as Hawaii and Vermont. This movement has resulted in state laws, local ordinances and policies at both levels that require 100% of a city or state’s electricity to come from renewable power sources such as wind and solar. The first and most basic problem with the 100% renewables goal is that if by “renewable” one means sources of electric power that neither generate CO2 emissions or emissions of conventional pollutants such as particulates and sulfur dioxide, then such a goal is impossible. The sun is beneath the horizon half of the time, and near it for another two hours or so, dramatically reducing incident radiation on passive solar panels. Wind is highly variable. Thus, wind and/or solar can supply 100% of electricity demand only if it can be stored for later use. At present, the only commercially feasible way to store sufficient electrical energy to deal with the daily fluctuations in wind and solar production is pumped hydro storage in which water is pumped uphill at night (when electricity demand is low) to a storage reservoir, and then released during the day, spinning a generation turbine. But solar with pumped hydro is extremely expensive. For example, even assuming a solar plant capable of providing power during the day for a city of 160,000 people with the other half of the energy produced used to pump water uphill, the total capital cost of solar including storage is likely to be at least ten times the cost of electricity from a natural gas power plant, according to Philip Dowd, a member of the Board of Visitors at Carnegie Mellon University. This is a best case scenario. During the winter, when solar generation is at its lowest, enormous amounts of hydro storage would need to be provided to ensure that power would be available when winds are light. Ironically the lowest temperatures of the year, which can produce the highest demand for electricity, often occur under calm conditions. This requires enormous investment. A study of European renewable energy estimates the wintertime hydro storage requirement is bigger than the combined European hydroelectric capacity; that is, all the water impounded behind all the dams in Europe does not contain enough potential energy even to cover European power needs during calm periods in the winter. So if an electrical system relying 100% on renewables is infeasible, what then does an electrical grid with heavy reliance on renewables actually look like? For an answer, one can look to Germany, the country that has spent the most to subsidize wind and solar generation with feed-in tariffs that far exceed the market price for electricity. While Germany has succeeded in increasing the share of wind and solar in German electricity production to over 30 percent, the average German household spent 50 percent more on electricity in 2016 than 2007. German firms open new manufacturing facilities not in Germany, but in Slovakia and other countries with much cheaper electricity. Even with all this, German carbon dioxide emissions grew in 2015 and 2016, while those in the U.S. fell by an average of two percent per year. To understand the German result, it is necessary to know a bit about the economics of wholesale electric power markets. When they are actually available, there is zero variable (or, in economic jargon, marginal) cost to produce wind and solar power. At such times, solar and wind producers flood the wholesale electricity market with power. As shown recently by economist Andreas Gerster, conventional natural gas and coal-based power generating facilities are actually paying distributors to take their power because the alternative of ramping down and then restarting generation is even more costly. So, Gerster concludes, as renewable energy goals become more and more aggressive, negative price spikes become more and more frequent and conventional fossil-fuel based power sources are no longer financially viable without themselves being subsidized. In addition to these costly impacts on electric power distribution, the present day environmental costs of 100% renewables are considerable. Aspen, Colorado is now 100% renewable, but 46% of its power is hydroelectric, and even though several environmental stream protection groups stand in opposition, city leaders continue to pursue the option of someday damming beautiful Castle and Maroon Creeks behind 150 foot dams so as to meet their 100% renewables pledge. Senator Bernie Sanders’ hometown of Burlington, Vermont says it has now reached a 100% renewables goal, but Burlington gets one third of its power from burning wood chips and another third from two hydroelectric facilities. Burlington gets its hydro in part from facilities operated by Hydro Quebec that were strongly opposed by environmentalists and tribal governments as environmentally catastrophic. It might be argued that all these unintended consequences can be avoided by relying on geothermal energy – heat generated by the radioactive decay of minerals in the earth’s crust. It is true that in 2016, California got 5.8% of its electric power production from geothermal. However, 43 percent of California’s geothermal power came from The Geyers, a complex that is over 50 years old. The Geyers and most other California geothermal power production facilities are located in or near the Long Valley caldera, an active volcanic geological system lying between the Owens Valley and Mono Lake in the eastern Sierra Nevada. According to the USGS, magma is actively rising in a 100-square mile area in the central part of the caldera, causing a dome-like swelling centered in the low forested hills in the middle of the caldera. The continuing threat of volcanic activity in the Long Valley caldera has an upside, a relatively low cost of turning geothermal power into electricity. Outside California and other locations propitiously (or perhaps not) located in active volcanic areas, making geothermal electric power a reality is much more costly and difficult. In Canada, for example, in 2011, “disillusioned about the ability of geothermal power to be anything other than a bit player in the world energy equation,” Limina Copper CEO Ross Beaty merged a geothermal power company he had created with a $150 million investment into another company that produces power from wind on hydro power. According to Beaty, drilling is very costly due to the wide-diameter, kilometres-deep drill holes that must be bored into complex, high-pressure and high-temperature rock formations containing high-temperature fluids, with massive volumes of water often required to cool the geothermal fluid before it can be reused and highly flammable chemicals used in electrical production. With all these on-site issues, geothermal systems are often located far from electrical demand, requiring long and costly electrical transmission lines. There is no geothermal plant operating anywhere in Canada, and aside from a few areas in the U.S., the Canadian experience is likely to be matched here. For the foreseeable future, the 100% renewables goal is yet another piece of progressive environmental rhetoric that in reality means higher costs for consumers and no improvement for the present environment. Spinal Tap. The original and still the best! Nonsense makes the heart grow stronger. Oh how I wish that the bell ringing gotten crier opinion corners could understand this. That they can read it is not in doubt, it’s whether they will, and we know they won’t.